Today in one of the largest sites for football modes moddingway. 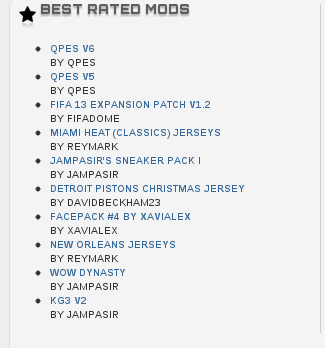 Qpes v6 (Pro Evolution Soccer 2013 unofficial update) is ranked as the best. Thank you for using qpes. We will continue to strive to make the best mode. Only with you as possible. Consider making a donation. Share this link on your Facebook, Twitter, Google + and other social profile. Just so we can be even better. If you have a website please feel free to qpes on it and a backlink to our site.